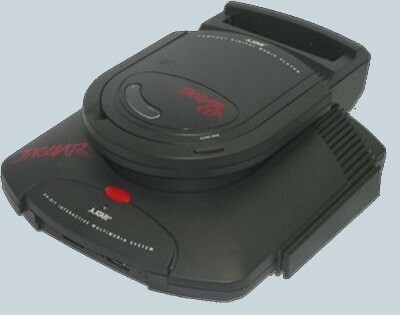 The last 64bits console from Atari, It's not an easy system to develop for, because of the atypic hardware. Everything must be coded in assembly language to get the best from the machine. This is not a well known console, but there is a very cool community for it ! 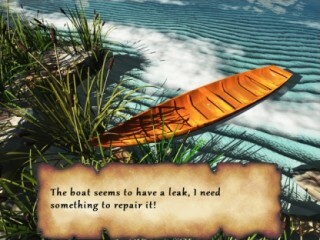 Elansar is a point & click adventure game, a nice story and photo realistic graphics. A CD version is available ! Check my retroshop ! 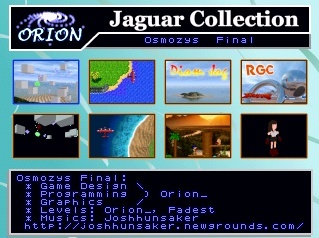 This is a game compilation that contains my previous released games I created for the Atari Jaguar. The games were revamped and improved so you can consider them in a final state. 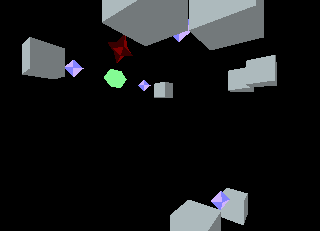 -Osmozys 3D : A 3D Puzzle Game, collect diamonds and avoid dangerous enemies ! 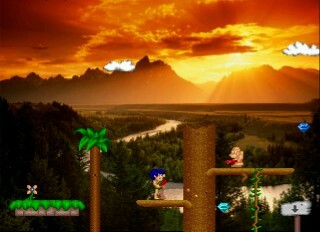 -JungleJag: A small platform game. -12 Tech Demos: Some little preview, intro and demos I made for the Jaguar. Here is the third game I made for the Jaguar and for the JagCode II contest. 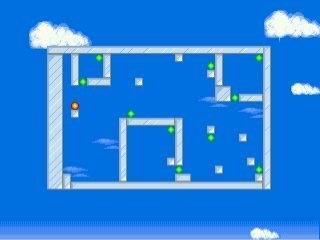 You are a little green ball and through 5 levels, you have to collect all the blue diamonds. Beware of the red enemies and the level empty borders ! 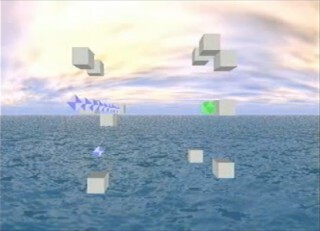 This is my first 3D game ever, I put a lot of work on making my own 3D engine, sound engine, and everything from the code to the graphics and musics are my own creation. I finished the game in a rush so this is only a demo of 5 levels and I plan to finish the game with more levels and stuff, and to release it on the JaguarCD. This is the second game I did for the Jaguar, it was done for the Jagcode 500 contest. It's a 2D platform game with 5 levels, enemies, and diamonds to collect. Check the Jagcode 500 contest download page if you want to download the CD image version of the game. This is the first game I made on this console, in about 2 weeks. It's a little puzzle like game with an online score system. Check the Diamjag's website for the online score system and if you want to download the CD image version and some extra like DVD Jacket and wallpaper. 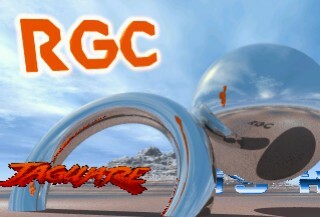 A little demo I made for the RGC 2006, featuring a fake truecolor raytraced scroller. This is a Cinepak Movie Player module for Jaguar CD developers ! Easy to use, with this new version including an IMA ADPCM Audio codec ! This will allow you to play Cinepak Movies with 22kHz 16bits Stereo Audio with the same data rate as a 8bits mono Audio stream ! Source code and tools included. I bring you a set of tools and sources code for Jaguar CD development ! Including CD encryption tool, CD record tool, CD Make track tool, CD File system, Jaguar CD library (data/FS/audio) and Memory Track library. Here is a little tool for BJL users that are tired of waiting long transfer time ! and add a little header program that will automatically unpack your program on Jaguar and start it as usual. The Jaguar is a bit painful to develop for, and especially when coding on its most powerful processors, the GPU & DSP. Unfortunately, with a homebrew devkit you can't debug step by step your code, which become very annoying when coding in assembly language. 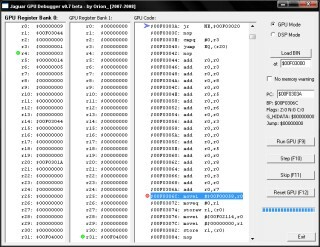 I was tired of getting headaches with hand debugging, so I made this GPU Debugger with a nice Windows interface.